Dining by Design makes a return appearance in Boston this week. Fantastic table displays await during this three day event, proceeds of which go to support the Community Research Initiative of New England. Click here for more information. Here is a photo I took at last years’ event. 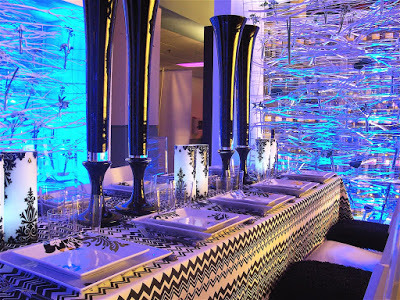 This electric space was designed by Billy Evers of Rafanelli Events Management and Marc Hall of Winston Flowers and was sponsored by Ricardo H. Rodriguez and Michael Kelley. This image also appeared in Elle Decor magazine a couple of months ago as part of a spread on the 2007 Boston event! Click here for more images from the 2007 event. JANUS et Cie, designed by Janice Feldman Kravet Inc.
Am very excited to attend the event this weekend, so stay tuned for photos! I am DYING to go to one of these events! I want one of these to come to L.A. and I want to attend! Do they do this in L.A. and do you have a connection for moi? Hate to tell you Fifi, but the LA dbd was in September. But, there’s always next year!